Ahhh, central Maui. From ponds to plantations, this lovely area of the island has something for everyone! Picture yourself at the helm of a boat, cruising along the turquoise waters as the sky showcases a brilliant sunset. Its not hard to see why so many people have boat rides on their Maui bucket list! Feel like a adventurous morning? Or maybe a dinner cruise is more your speed. Don’t worry, we’ve got both! With visibility reaching 100 feet, this fantastic snorkeling trip is bound to make all your tropical fish dreams come true. If you’re lucky, you can even add monk seals and dolphins to your list of sights seen! These expert guides will take you on a joyride on their 55-foot catamaran, and will direct you to the snorkeling hotspots around Molokini! This is what romance movies are made of! With a tropical sunset and live music in the background, this cocktail and dinner cruise has paradise written all over it! After you’ve feasted on a decadent prime rib dinner, feel free to go below and tango the night away on their dance floor! This cruise is the perfect way to spend a night in Maui! Ok, the fish and chips are actually two separate stops. From a breathtaking aquarium to a local eatery, these next two stops can fill your whole day with fun! First up, the fish! This stunning aquarium only hosts Hawaiian marine life, which lends itself to a more locally informative experience. Their vast knowledge and ocean safety tips make this visit a worthwhile stop for everyone in your group. And you will definitely want to check out their 750,000 gallon shark tank, which is always filled with wide variety of very big fish! 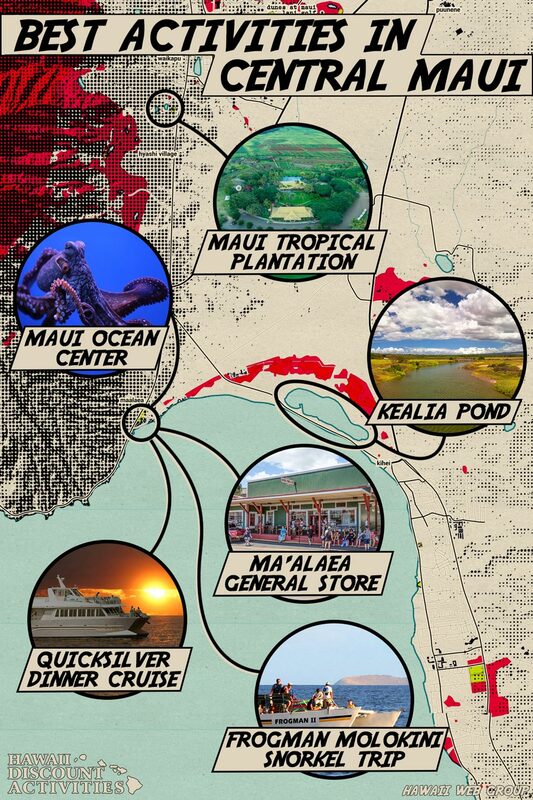 Once you’ve had your fill of the Maui Ocean Center, pop on down to the Maalaea General Store for a bite to eat! If you want to eat like a local, why not try their Local Moco Burger, a 1/2 lb natural Maui beef patty topped with an egg, smothered in gravy, 2 scoops rice and 1 scoop macaroni salad on the side! If you’re not that adventurous, there are plenty of burgers, salads and sandwiches to choose from. This locally sourced eatery is the perfect place to relax with a view of the harbor! Not all of Maui is palm trees and sandy beaches! These next two stops will fill any nature lovers need for wide open spaces! And there are quite a few feathered friends to keep you company! This wetland salt marsh is actually a well-known bird refuge, hosting more than 30 different species, most notably two of Hawai‘i’s endangered waterbirds, the Hawaiian coot and Hawaiian stilt. If you’re visiting in the winter, you’ll see the freshwater pond expand to about 400 acres. And if you come by in the summer months, the pond is about half that size and leaves a salty residue in its wake. There is a boardwalk that goes along the perimeter of the pond and has a self-guided tour, with descriptions of the habitat and its feathered friends! This breathtaking plantation has something for everyone! As the name suggests, this lush property is teaming with tropical foliage. And if you don’t feel like meandering down the path, there’s a tram tour with your name on it! From ziplining to feeding the ducks at the pond, you could spend a full day here! And you don’t want to miss their live entertainment! And the food is some of the best on the island! Chef of the Year Jeff Scheer will treat you to a 5-star dinner while you’re being serenaded! Talk about a perfect day in paradise! From land to sea, you’ve got the guide to some fabulous activities in central Maui!